Military engineering is loosely defined as the art, science, and practice of designing and building military works and maintaining lines of military transport and military communications. Military engineers are also responsible for logistics behind military tactics. Modern military engineering differs from civil engineering. In the 20th and 21st centuries, military engineering also includes other engineering disciplines such as mechanical and electrical engineering techniques. According to NATO, "military engineering is that engineer activity undertaken, regardless of component or service, to shape the physical operating environment. Military engineering incorporates support to maneuver and to the force as a whole, including military engineering functions such as engineer support to force protection, counter-improvised explosive devices, environmental protection, engineer intelligence and military search. Military engineering does not encompass the activities undertaken by those 'engineers' who maintain, repair and operate vehicles, vessels, aircraft, weapon systems and equipment." Military engineering is an academic subject taught in military academies or schools of military engineering. The construction and demolition tasks related to military engineering are usually performed by military engineers including soldiers trained as sappers or pioneers. In modern armies, soldiers trained to perform such tasks while well forward in battle and under fire are often called combat engineers. As the design of civilian structures such as bridges and buildings developed as a technical discipline, the term civil engineering entered the lexicon as a way to distinguish between those specializing in the construction of such non-military projects and those involved in the older discipline. As the prevalence of civil engineering outstripped engineering in a military context and the number of disciplines expanded, the original military meaning of the word "engineering" is now largely obsolete. In its place, the term "military engineering" has come to be used. The first civilization to have a dedicated force of military engineering specialists were the Romans, whose army contained a dedicated corps of military engineers known as architecti. This group was pre-eminent among its contemporaries. The scale of certain military engineering feats, such as the construction of a double-wall of fortifications 30 miles (48 km) long, in just 6 weeks to completely encircle the besieged city of Alesia in 52 B.C.E., is an example. Such military engineering feats would have been completely new, and probably bewildering and demoralizing, to the Gallic defenders. The best known of these Roman army engineers due to his writings surviving is Vitruvius. In ancient times, military engineers were responsible for siege warfare and building field fortifications, temporary camps and roads. The most notable engineers of ancient times were the Romans and Chinese, who constructed huge siege-machines (catapults, battering rams and siege towers). The Romans were responsible for constructing fortified wooden camps and paved roads for their legions. Many of these Roman roads are still in use today. For 500 years after the fall of the Roman empire, the practice of military engineering barely evolved in the west. In fact, much of the classic techniques and practices of Roman military engineering were lost. Through this period, the foot soldier (who was pivotal to much of the Roman military engineering capability) was largely replaced by mounted soldiers. It was not until later in the Middle Ages, that military engineering saw a revival focused on siege warfare. Military engineers planned castles and fortresses. When laying siege, they planned and oversaw efforts to penetrate castle defenses. When castles served a military purpose, one of the tasks of the sappers was to weaken the bases of walls to enable them to be breached before means of thwarting these activities were devised. Broadly speaking, sappers were experts at demolishing or otherwise overcoming or bypassing fortification systems. With the 14th-century development of gunpowder, new siege engines in the form of cannons appeared. Initially military engineers were responsible for maintaining and operating these new weapons just as had been the case with previous siege engines. In England, the challenge of managing the new technology resulted in the creation of the Office of Ordnance around 1370 in order to administer the cannons, armaments and castles of the kingdom. Both military engineers and artillery formed the body of this organization and served together until the office's predecessor, the Board of Ordnance was disbanded in 1855. By the 18th century, regiments of foot (infantry) in the British, French, Prussian and other armies included pioneer detachments. In peacetime these specialists constituted the regimental tradesmen, constructing and repairing buildings, transport wagons, etc. On active service they moved at the head of marching columns with axes, shovels, and pickaxes, clearing obstacles or building bridges to enable the main body of the regiment to move through difficult terrain. The modern Royal Welch Fusiliers and French Foreign Legion still maintain pioneer sections who march at the front of ceremonial parades, carrying chromium-plated tools intended for show only. Other historic distinctions include long work aprons and the right to wear beards. The Peninsular War (1808–14) revealed deficiencies in the training and knowledge of officers and men of the British Army in the conduct of siege operations and bridging. During this war low-ranking Royal Engineers officers carried out large-scale operations. They had under their command working parties of two or three battalions of infantry, two or three thousand men, who knew nothing in the art of siegeworks. Royal Engineers officers had to demonstrate the simplest tasks to the soldiers, often while under enemy fire. Several officers were lost and could not be replaced, and a better system of training for siege operations was required. On 23 April 1812 an establishment was authorised, by Royal Warrant, to teach "Sapping, Mining, and other Military Fieldworks" to the junior officers of the Corps of Royal Engineers and the Corps of Royal Military Artificers, Sappers and Miners. 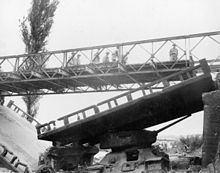 A Bailey bridge being deployed in the Korean War to replace a bridge destroyed in combat. The need to defeat the German defensive positions of the "Atlantic wall" as part of the amphibious landings in Normandy in 1944 led to the development of specialist combat engineer vehicles. These, collectively known as Hobart's Funnies, included a specific vehicle to carry combat engineers, the Churchill AVRE. These and other dedicated assault vehicles were organised into the specialised 79th Armoured Division and deployed during Operation Overlord – 'D-Day'. Military engineers can come from a variety of engineering programs. They may be graduates of mechanical, electrical, civil, or industrial engineering. Modern military engineering can be divided into three main tasks or fields: combat engineering, strategic support, and ancillary support. Combat engineering is associated with engineering on the battlefield. Combat engineers are responsible for increasing mobility on the front lines of war such as digging trenches and building temporary facilities in war zones. Strategic support is associated with providing service in communication zones such as the construction of airfields and the improvement and upgrade of ports, roads and railways communication. Ancillary support includes provision and distribution of maps as well as the disposal of unexploded warheads. Military engineers construct bases, airfields, roads, bridges, ports, and hospitals. During peacetime before modern warfare, military engineers took the role of civil engineers by participating in the construction of civil-works projects. Nowadays, military engineers are almost entirely engaged in war logistics and preparedness. The Royal School of Military Engineering is the main training establishment for the British Army's Royal Engineers. The RSME also provides training for the Royal Navy, Royal Air Force, other Arms and Services of the British Army, Other Government Departments, and Foreign and Commonwealth countries as required. These skills provide vital components in the Army's operational capability, and Royal Engineers are currently deployed in Afghanistan, Iraq, Cyprus, Bosnia, Kosovo, Kenya, Brunei, Falklands, Belize, Germany and Northern Ireland. Royal Engineers also take part in exercises in Saudi Arabia, Kuwait, Italy, Egypt, Jordan, Canada, Poland and the United States. ^ a b "military engineering". Encyclopædia Britannica Inc. 2013. Retrieved 13 February 2013. ^ NATO publication (1 April 2008). MC 0560 "MILITARY COMMITTEE POLICY FOR MILITARY ENGINEERING". NATO. ^ Bernard Brodie, Fawn McKay Brodie (1973). From Crossbow to H-bomb. Indiana University Press. ISBN 0-253-20161-6. ^ Museum, Royal Engineers. "Corps History – Part 2". Archived from the original on 4 February 2010. Retrieved 12 January 2010. ^ Langins, Janis. Conserving the Enlightenment: French Military Engineering from Vauban to the Revolution. Cambridge, Massachusetts MIT Press. 2004. ^ "Become a Military Engineer: Step-by-Step Career Guide". ^ Chambers, John (2000). "Engineering, Military". Encyclopedia.com. Retrieved 14 February 2013. 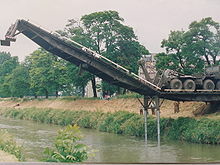 Wikimedia Commons has media related to Military engineering.